Can I tell you how excited I have been this week? 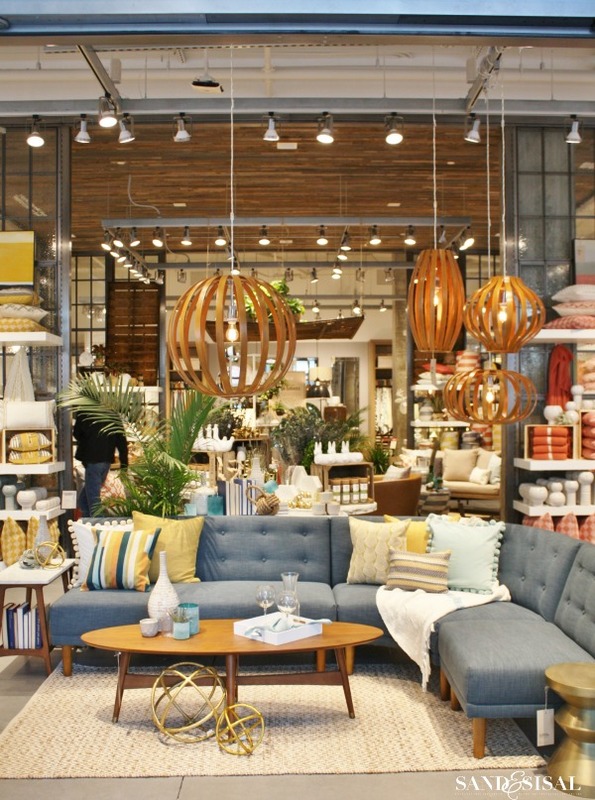 West Elm has opened here in my area, Virginia Beach Towne Center! If you follow me on Instagram then you most likely already saw a sneak peek of this gorgeous store. 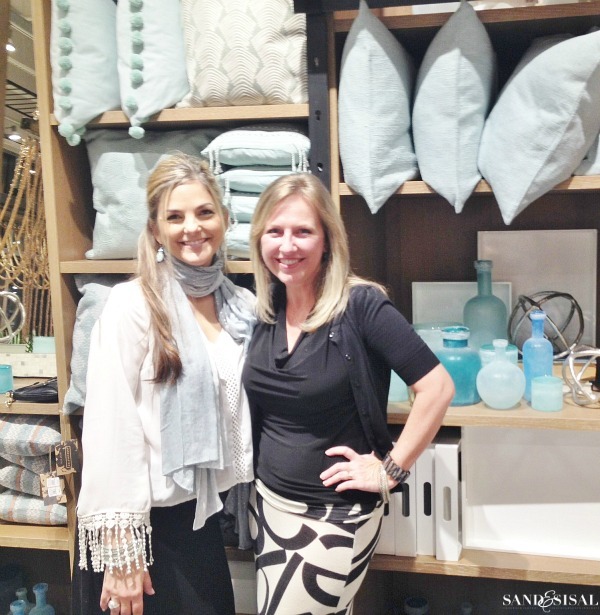 I had the wonderful opportunity to have a tour of West Elm Virginia Beach before the grand opening, guided by the delightful Nicole, Director of PR (pic above). Woo hoo! 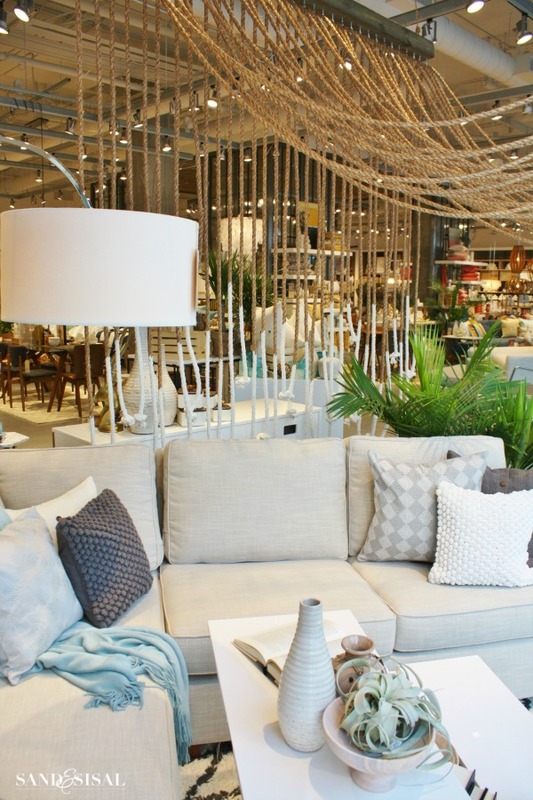 @westelm has arrived to Virginia Beach Towne Center! I’m so happy & excited to be celebrating & partnering with them for the grand opening! Get ready for more gorgeous new product pics & spring makeover post coming soon! 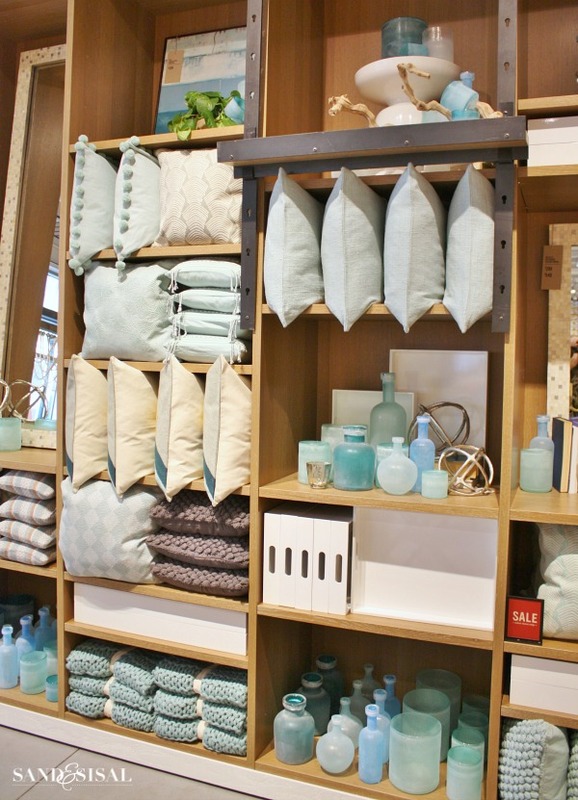 I’ve always loved West Elm. My dining room rug is from them. 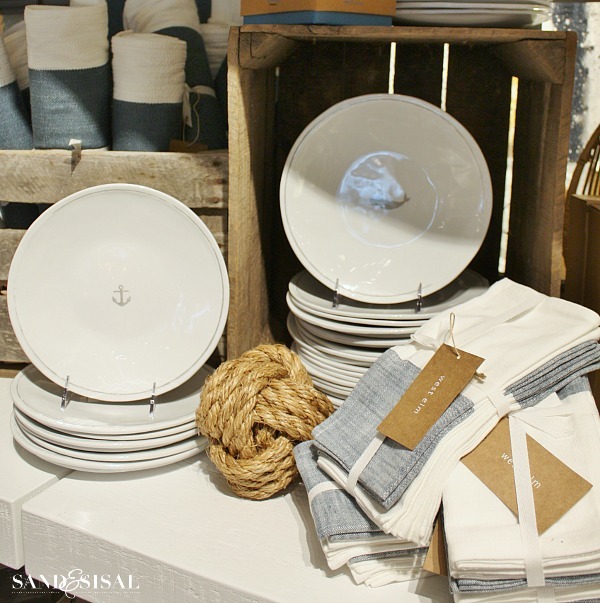 West Elm’s spring and summer collection has a wonderful coastal chic vibe that captures and reflects the flavor of Virginia Beach. 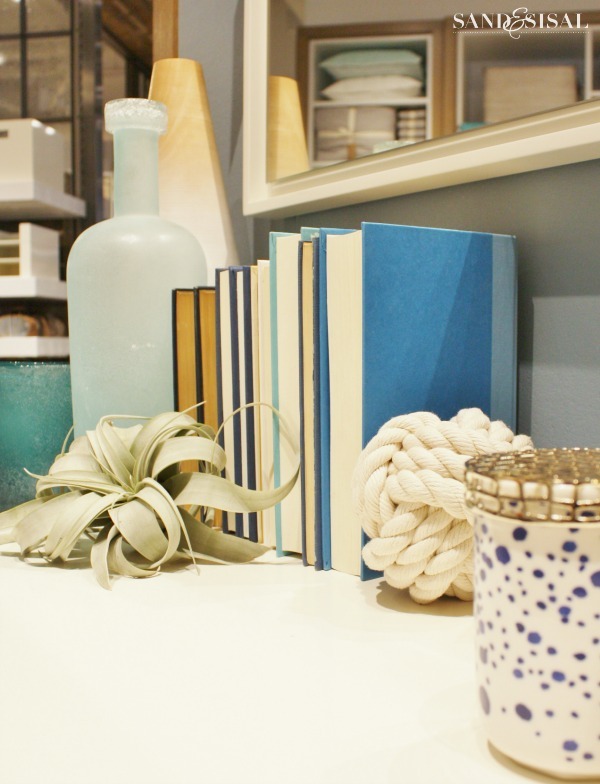 Watery, pale shades of pool, turquoise, navy and seaglass paired with crisp white, creamy, irredescent capiz, sea grass and sandy linen form the West Elm coastal color palette. 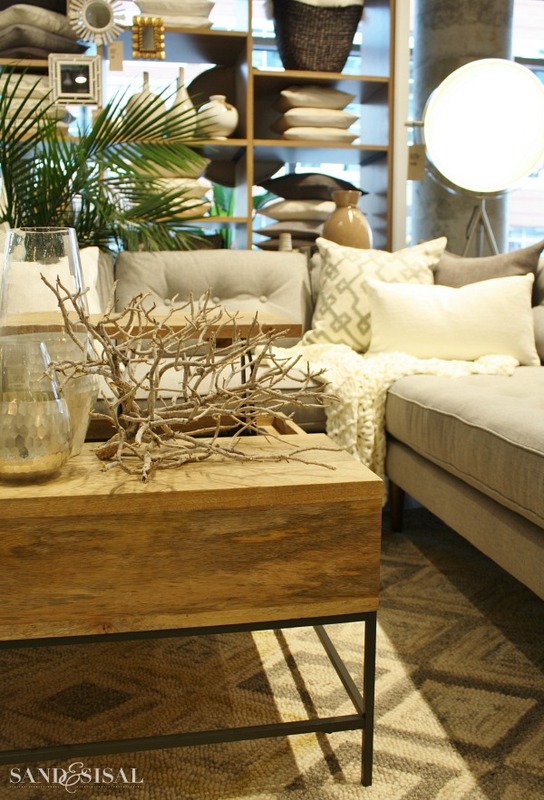 Texture, texture, texture is one word to describe West Elm. 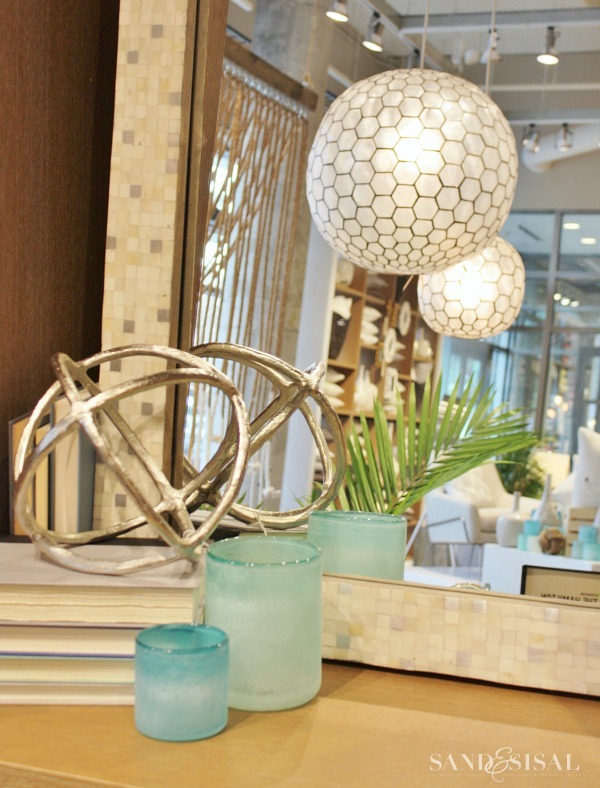 Knobby soft pillows, chunky fuzzy throws, sand blasted glass, reclaimed wood, metallics, and high gloss laquers all work together to help you create a home that is beautifully coordinated and rich in visual interest and comfort. If you love capiz shells then you will adore their capiz shell chandelier collection. 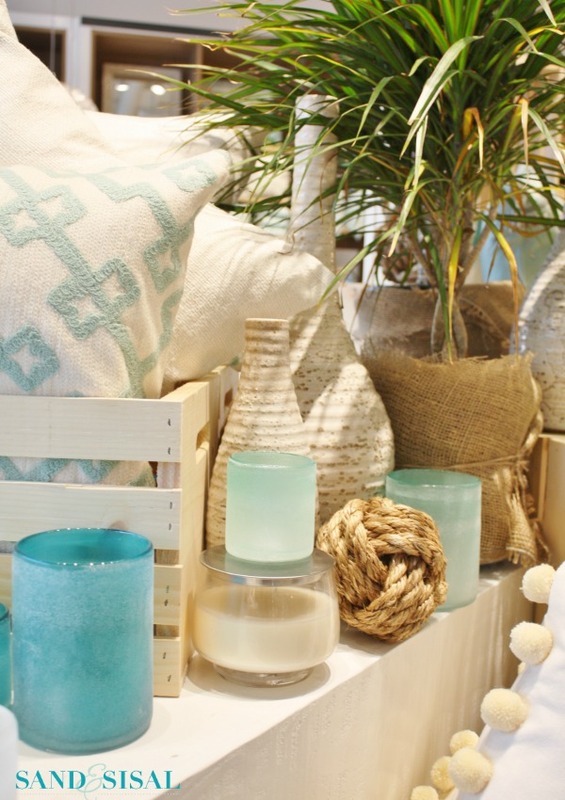 Of course if you have been a fan of Sand & Sisal then you know that I was immediately drawn to the sea glass vases and bottles. A fun highlight of the preview was a grand opening cocktail party! I invited my friend Nancy from Artsy Chicks Rule to come with me. We sipped on sparkling flutes of champagne with raspberries and shopped the store, ooooing & ahhing. Forget two-toned furnishings, how about six-tones? West Elm has a great new Patchwork Collection of furniture which has a richly grained facade featuring 6 eclectic furnishes. West Elm has had a long standing dedication to working and empowing artisans all over the world and bringing their goods to their stores. What I also learned was that in addition to their global outreach, they are also dedicated to the local community. They have partnered with ETSY to bring a representation of local artists’ works to each store. For example, the monkey knot rope ball (pic above) and the framed prints (pic below) are both by local artisans. 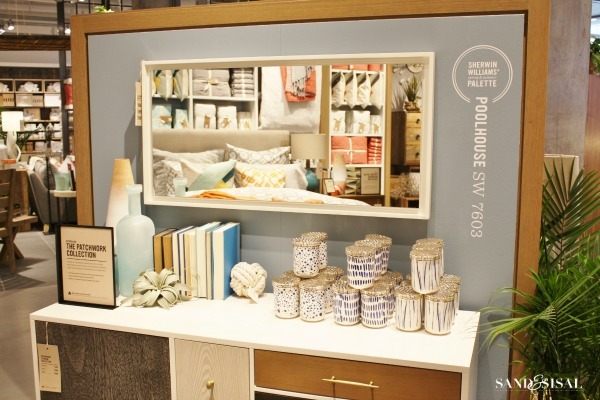 West Elm rocks visual merchandising! 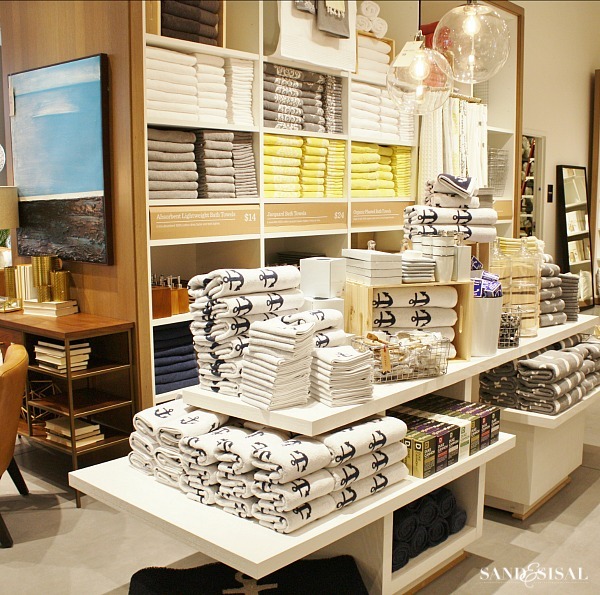 The store was full of creative design installations. This white dipped, knoted sisal rope canopy was stunning! It was hard to get a good picture of it because it is right against the front glass, but you get the idea. I love it! If you prefer a more neutral and sophisticated palette then just check out the variety pictured below. They combine foggy gray tones with sandy linens, warm gold and wood and soft brushed silver in a casual yet slightly industrial flare. The rustic wood storage coffee table (pictured below) is one of their most popular selling tables. Besides all the gorgeous furniture, bedding, and accessories available at West Elm, you can also find interesting botanicals for the home. 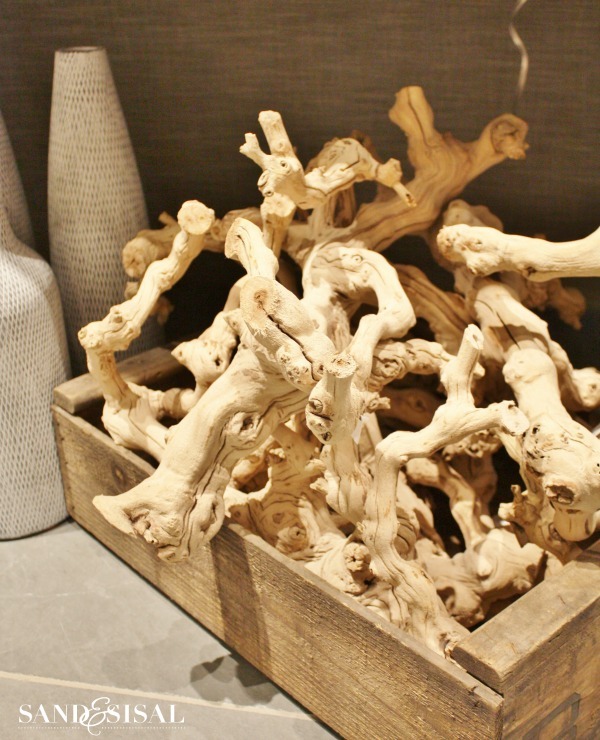 My eyes opened wide with childlike happiness upon seeing the driftwood toned Manzanita & Grapewood branches available for purchase! 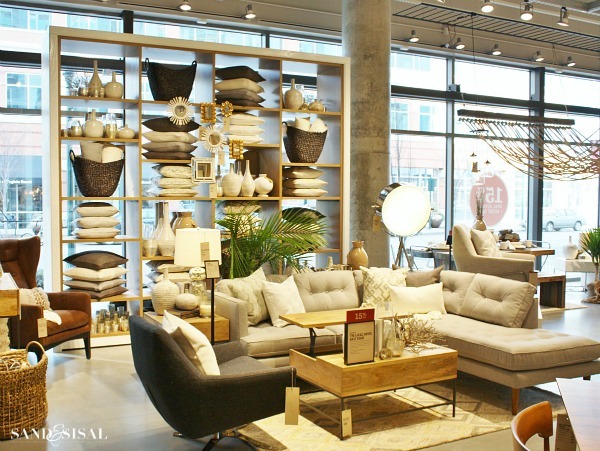 Visual candy is another word to describe West Elm’s stores. Just look at how they “package” their Crinkle Duvet Covers & Shams! Genius and beautiful! 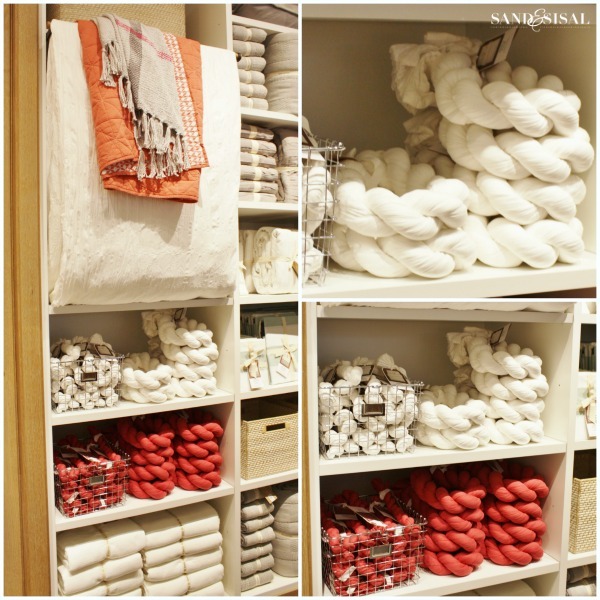 I hope you enjoyed this little shopping spree with me at West Elm Virginia Beach! 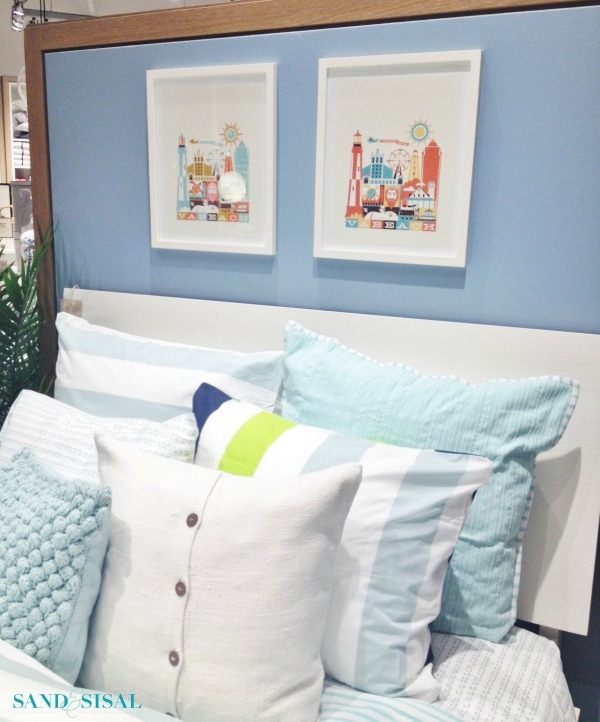 Stay tuned for a spring mini-makover soon in my home showcasing some of these gorgeous finds from West Elm. Do you see something you want? Let me know what caught your eye! I love the beach themed jars and vases. They look like the ones that you made. Just gorgous. Love it all! Is that rope canopy something that they sell? Hi Letty! No it isn’t, the canopy is just part of the display. It really is neat isn’t it? Yay!!! Thanks for letting me know! I’m getting pretty bored with Home Goods…. I think they’re sick of me too! I just saw that Anthropology had opened at Town Center too! Woo Hoo! Perfect time for renovating our condo at the Oceanfront! Hi Janet! 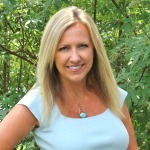 You will have to stop by… it’s gorgeous! And guess what? 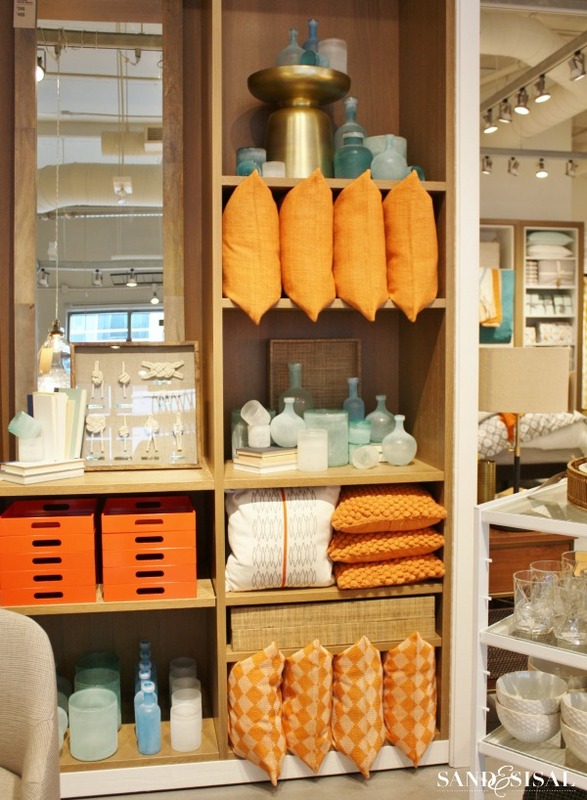 Anthro is just next door to West Elm! Love it all – everything seems so beachy! I am craving summer after dealing with this insane winter weather in the northeast!